The Chapelle des Jesuites is a historic church recognized as a UNESCO World Heritage Site along Rue Dauphine in Old Quebec in Quebec City, Canada. A historic church built in 1818 known as the Chapelle des Jesuites shows off its beautiful architecture in the sunlight along Rue Dauphine in Old Quebec City, Canada. The architecture is a neo-classical style with the interior of the Chapelle des Jesuites beautifully decorated with its sculpted pine altar, Medard Bourgault's Stations of the Cross and a variety of statues. Stained glass windows are scattered throughout the building, showing off their beauty when the sunlight filters through. 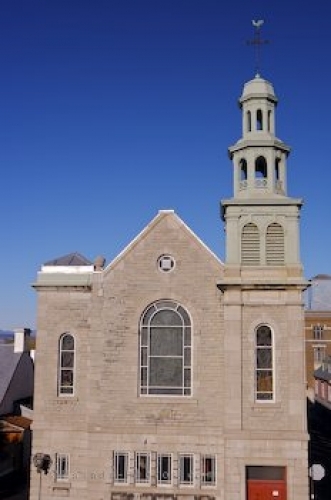 Picture of Chapelle des Jesuites, a heritage church in Old Quebec in Canada. This heritage church is filled with history and is a quaint chapel to see while visiting Old Quebec in Quebec City, Canada. Chapelle des Jesuites, Church along Rue Dauphine in Old Quebec, Quebec City, Quebec, Canada. UNESCO World Heritage Site.